Anyone who is from New Orleans will tell you that New Orleans is the best city in the country, but really, is it? 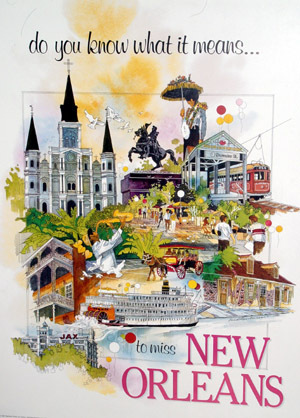 What does New Orleans have that no other place in the USA doesn’t have? Being that it is carnival time, I have to start with Mardi Gras. Some cities have tried it but no other city shuts down for the celebration and throws such a big party. Jazz and Blues. Well, so does Chicago, New York, Detroit, etc. so I will scratch this. New Orleans has some of the best in the country though. Cajun and Creole cooking! Others are trying it but not to the New Orleans standards. Biggest Historic District in the Nation! At least 1 local festival everyday of the year! Not sure if I am incorrect here. Leave a comment if I am. The cheapest and best place for crawfish and oysters. Well almost, you also have Lafayette and some cities along the South Coast. Home of the first mixed drink, Sazerac! SUPER BOWL 44 CHAMPIONS! Who Dat! Hosted the most Super Bowls in country along with Miami. Survived the biggest disasster in the Nations history, Hurricane Katrina. Northern most Carribean city. Debatable! More churches per square mile. More bars and restaurants per square mile. And yes the list goes on. If you have more accomplishments that are not listed here that need recognition then please post them in the comments below.